On Friday 7 October 2011, the Nobel Committee in Oslo announced three winners of the 2011 Nobel Peace Prize. This year, the peace prize worth $1.5 million was split between three women, including Tawakkul Karman - the first Arab woman to win the prize. The 2011 Nobel Peace Prize is of great significance because it highlights the struggle for women's rights by brave women around the world, and the role of women in the fight for peace, democracy and human rights in Africa and the Middle East. Even more significant is the fact that one of the laureates, 32-year-old Tawakkul Karman, is the first Arab woman to receive the prestigious prize for peace since 1901. 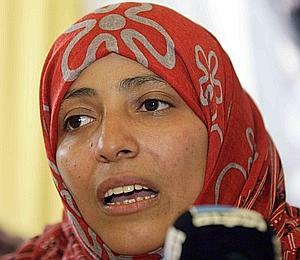 Tawakkul Karman is a journalist from Yemen and human rights activist. She is at the forefront of pro-democracy demonstrations calling for the ouster of President Ali Abdullah Saleh who has been in power since 1978 - one year before Karman was born in Taiz, Yemen. Karman is a leading figure in the pro-democracy demonstrations in Yemen. According to Reuters, she has been dubbed "Mother of the Revolution." She was out on the streets demonstrating when news broke that she had been awarded the peace prize. She reportedly led demonstrations in Yemen earlier this year, in support of Tunisian and Egyptian revolutions that ousted Zine El Abedine Bin Ali of Tunisia and Hosni Mubarak of Egypt. To say the least, she has been an ardent supporter of reform in the North Africa and the Middle East. No doubt she branded the award of the prize "a victory for the Arab Spring in Tunis, Egypt, Libya, Syria and Yemen." The award of the 2011 Nobel Peace Prize to a woman who wears the Islamic veil challenges prejudice and stereotypes against Muslim woman who wear the headscarf - many of whom continue to face untold discrimination in many areas of life simply because of their belief and the way they dress. The prize comes at a difficult time for Arabs and Muslims around the world. In Europe, islamphobia is on the rise in many countries, including the Nordic countries of Finland, Norway and Sweden - where the immigration debate has gone soar and Arabs and Muslims are used as political punching bags by a growing number of extreme right-wingers. In the U.S., Arabs and Muslims are the "usual suspects" and are having a tough time in a society that prides itself as "free." In the Middle East and North Africa, thousands have lost their lives in what has been termed the "Arab Spring." In Syria alone, more than 2700 have been killed by a brutal regime and the UN Security Council has been unable to act because Russia and China decided to side with the oppressor. In Yemen, a dictator clings to power despite popular calls for him to relinquish power. The 2011 Nobel Peace Prize is a victory for millions of Arab women who struggle to overcome discrimination and prejudice in both closed and open societies around the world. They too deserve to be treated with respect and without discrimination of any kind. Among them are respectable citizens of the world, working hard, sometimes at great personal risk, to make the world a better one for all. The "Islamic headscarf" is not what defines an individual. Nobel laureate Tawakkul Karman is the founder and head of an organization called "Women Journalists without Chains." The other two women - Ellen Johnson Sirleaf (President of Liberia) and Leymah Gbowee - who share the Nobel Peace Prize 2011 cannot be overlooked. They too are phenomenal women who have challenged the status quo and asserted the pivotal role of women in Africa and beyond.